If you’re like me, you follow bike racing enough to grasp the basics and be familiar with most of the big names. I’ll typically follow the TdF fairly closely, but other than that my cycling news consumption pretty much consists of whatever cool stuff Cosmo happens to write about. That means that when the TdF does roll around, I’m embarrassed to admit that I have a hard time keeping the different teams straight. They all have funny names built around foreign companies and people will often just abbreviate them. And of course every few years, the sponsors change and so do the names. Keeping track of which riders are on which teams is a bit much for me, but a more manageable goal is to have a rough sense of what countries the riders are from on each team. Yeah, Euskaltel-Euskadi being Basque only I can remember. But there are always a bunch of “French” teams that just sort of blend together in my head: AG2R, FdJeux, Cofidis and Bbox Bouygues Telecom (Seriously? Bbox?). Ok. Lampre is primarily Italian, Milram is mostly German and Footon-Servetto is mostly Spanish. Astana and Caisse d’Epargne are also mainly Spanish, but less than Footon-Servetto and Euskaltel-Euskadi. Quick Step, Rabobank and Katusha are Belgian, Dutch and Russian. From here immigration policies apparently get considerably looser. Saxobank (not to be confused with Rabobank, dammit!) has a plurality of Danes. Liquigas and Omega-Pharma-Lotto could be considered Italian and Belgian, but their immigrant populations are quite high: nearly half the team. Then we have the open borders club. 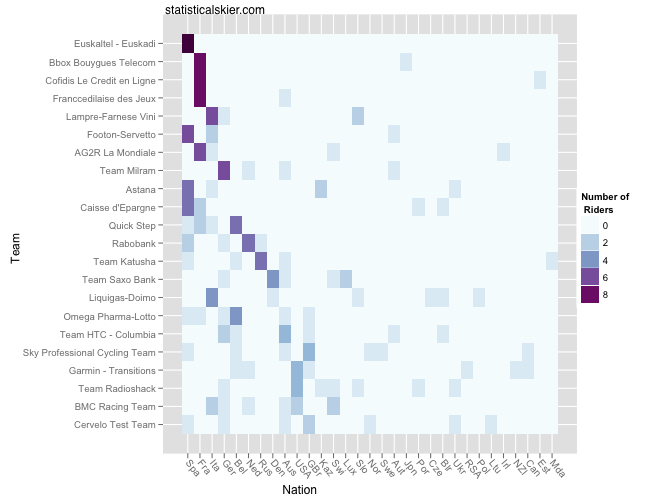 The remaining teams have a plurality of riders from nations like GBr, USA and Aus, but are generally quite diverse. Is this all a bit silly? Maybe. But it helps me keep the teams straight in my head, at least a little. Posted by Joran on Monday, July 19, 2010, at 9:47 am. Filed under Cycling. Tagged cycling, tour de france. Follow any responses to this post with its comments RSS feed. You can post a comment or trackback from your blog.